JERUSALEM, Jan 21 (Reuters) - U.S. Vice President Mike Pence's planned trip to Israel on Sunday has been overshadowed by President Donald Trump's announcement last month that the United States recognizes Jerusalem as the capital of Israel, and will start the process of moving its embassy there. Pence, an evangelical Christian, plans to meet Israeli leaders and to visit the Western Wall, the Israeli parliament and a Holocaust remembrance center in Jerusalem during the two-day visit, after stops in Egypt and Jordan. Pence, however, is not scheduled to meet any Palestinian leaders, who declined to see him. The trip was originally planned for December but was postponed after protests from Arab political and religious leaders - Muslim and Christian – about Trump's Jerusalem decision, which broke with decades of U.S. policy and drew widespread criticism from America's allies. Pence and David Friedman, the ambassador to Israel appointed by Trump, are thought to have pushed hard for both recognition and embassy relocation. It is a decision that was popular with many conservative and evangelical Christians who voted for Trump and Pence. Many of them support political recognition of Israel's claim to the city. Israel's government regards Jerusalem as the eternal and indivisible capital of the country, although that is not recognized internationally. Palestinians feel equally strongly, saying that East Jerusalem must be the capital of a future Palestinian state. The city even has different names. Jews call it Jerusalem, or Yerushalayim, and Arabs call it Al-Quds, which means "The Holy." In 1980 the Israeli parliament passed a law declaring the "complete and united" city of Jerusalem to be the capital of Israel. But the United Nations regards East Jerusalem as occupied, and the city's status as disputed until resolved by negotiations between Israel and the Palestinians. The King of Jordan retains a role in ensuring the upkeep of the Muslim holy places. Other countries have had embassies in Jerusalem in the past, but moved them out of the city some years ago. In December Guatemala's president, Jimmy Morales, said that his country will move its embassy from Tel Aviv. Israel's prime minister, Benjamin Netanyahu, said several countries were considering following the U.S. lead, but he declined to identify them. 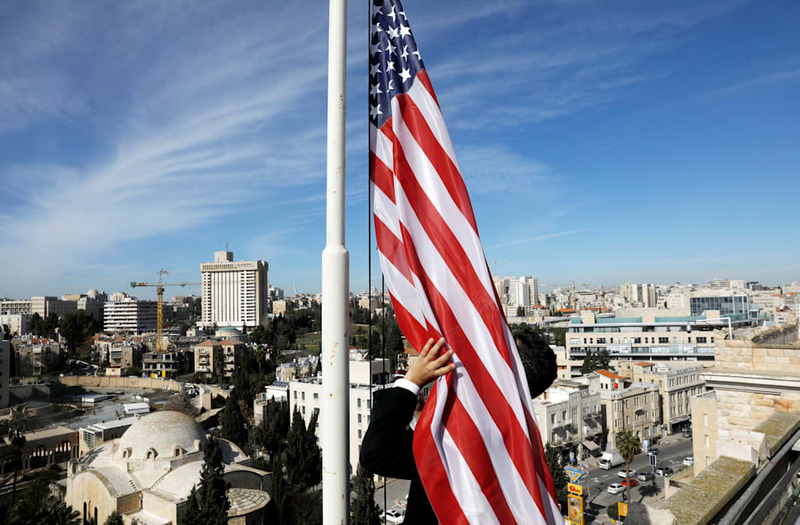 The timeframe of the U.S. embassy move is unclear, with different predictions from Israeli and U.S. officials about how soon it could happen. Since the announcement there has been tension, with Palestinian protests in Jerusalem, Gaza and the West Bank. At least 18 Palestinians and one Israeli have been killed since Trump's Dec. 6 announcement. Although the clashes between Palestinian protesters and Israeli forces have not been on the scale of the first and second Palestinian intifadas in 1987-1993 and 2000-2005, violence has erupted before over matters of sovereignty and religion. In 1969 an Australian Messianic Christian tried to burn down the Al-Aqsa Mosque. He failed, but caused damage. So charged was the Middle East's political climate - just two years after the Six Day War - that there was fury across the Arab world. In 2000, the Israeli politician Ariel Sharon, then opposition leader, led a group of Israeli lawmakers onto the Temple Mount/al-Haram al-Sharif complex. Palestinians protested, and there were violent clashes that quickly escalated into the second Palestinian uprising, also known as the Al-Aqsa Intifada. Arab leaders across the Middle East have warned that a unilateral American move could lead to turmoil, and hamper U.S. efforts to restart long-stalled Israeli-Palestinian peace talks.